Choosing Between PLA and ABS: Which one is better? 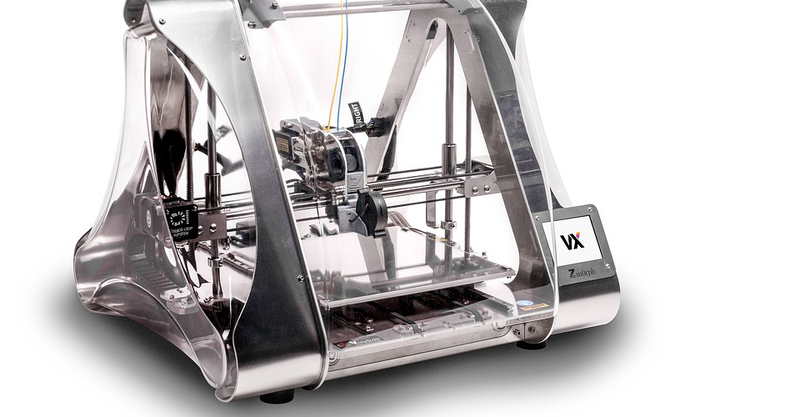 Desktop 3D printing using Fused Deposition Modeling (FDM) technology has evolved rapidly in the past several years. Nowadays, we have printers with advanced retraction abilities, two-zone heating, and improved positional accuracy. 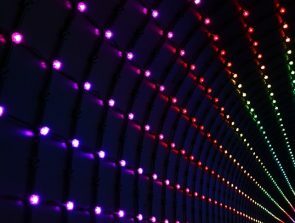 Filament choices have similarly expanded to include highly innovative and creative options such as glow-in-the-dark, conductive, or wooden filaments. Despite the wide range of available filaments, there are still two that remain at the top in terms of popularity and use: PLA and ABS. What makes these two filaments so popular? Given a choice between the two, which one should you pick? These are the questions we’re going to answer in this article. PLA stands for polylactic acid, a biodegradable polyester with building blocks made of lactic acid. PLA was first made way back in 1932 when Carothers heated a lactic acid under vacuum conditions while removing the water that was a product of condensation. In the early stages of its development, only the production of low-density PLA was possible. This was eventually improved by using lactide as a raw material. By undergoing a ring-opening polymerization process, a high-density version of PLA was eventually manufactured. The biodegradable and bioactive properties of PLA proved to be distinguishing characteristics, pushing its applications in the medical fields. PLA can be broken down and safely absorbed by the human body, making it an excellent material for sutures and stents. The development of larger-scale applications of PLA has risen in the past few decades, driven in large part by rising environmental consciousness in the consumers. Nowadays, PLA is viewed as a possible solution to the need to for a plastic material that is manufactured from renewable sources and is compostable. This addresses our worsening solid waste problem while also reducing our dependence on non-sustainable petroleum-based raw materials. Right now, PLA enjoys the second highest rate of production and use out of all bioplastics worldwide. What are the characteristics of PLA? PLA has a few unique characteristics that have made it popular not just in the field of 3D printing, but also in the manufacture of consumer-bound products and packaging materials. One of the best properties that distinguish PLA from other plastics is the fact that it is manufactured from plant material. The more commercially preferred process to create PLA uses lactic acid as a monomer to build the PLA polymer. Lactic acid is naturally formed by the bacterial fermentation of a carbohydrate source – it is essentially one of the components that make spoiled food smell bad. Of course, you can’t just let food go bad and get lactic acid from it. The fermentation has to happen in highly controlled conditions which will allow you to isolate pure lactic acid from the fermentation products. The ability to create lactic acid from any carbohydrate source opens up the process to a lot of raw materials derived from plants. Nowadays, the typical carbohydrate sources include corn starch, cassava roots, or sugarcane. All of these can be planted and harvested in just a couple of months, making a PLA a highly sustainable and renewable product. When 3D printing using PLA filament, a printing temperature between 150 to 160 °C is recommended. This is a pretty low temperature as far as printing filaments go. This means that printing with PLA is a naturally less power-intensive process. Considering the dozens of hours you could be spending 3D printing in a single month, this difference in power requirements could translate to significantly lower electricity bills. The low melting temperature needed to print using PLA also makes it an inherently less complicated process. Since the PLA filament material is not so hot when it is laid down on the build platform, the print endures less thermal stress once it starts to cool down. As we have written several times before, this thermal stress is what causes deformation or “warping” of the final print. Since there is less of a thermal gradient to overcome, printing with PLA typically does not require the use of a heated bed. Just slap on some blue painters’ tape on your non-heated bed, and you should be good to go. Since warping is not an issue with PLA, you can also do away with having to print rafts or brims along with your build. You’re also not going to need an enclosure for your build platform. PLA prints typically do not suffer from layer adhesion problems, so you should be able to print with PLA successfully even without a cooling fan. By printing at low temperature, PLA also avoids stringing, which is one of the most commons problems encountered in high-temperature printing. Stringing occurs when the melted portion of the filament drips through the nozzle while the print head is moving from one point of the build platform to another. 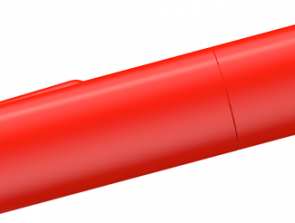 Since the hot end of the nozzle is set at a lower temperature when printing with PLA, the filament is a little more viscous and able to hold on to the nozzle by mere surface tension. The low printing temperature of PLA does not mean that it will always be the inferior choice from the perspective of structural integrity. 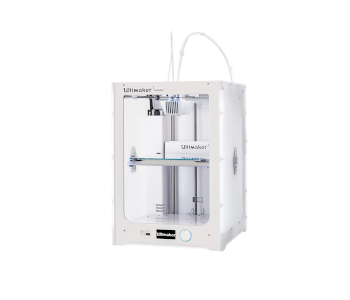 If you need a version of PLA that has better mechanical strength and temperature resistance, you can opt for a high-strength version that was made by mixing different PLA isomers. PLA is so versatile that it is now being used for microwavable containers, disposable cutlery, or even as engineering plastics. Food packaging has seen particularly heavy use of PLA due to its superior aesthetics and printability, as well as its resistance to grease and oils. PLA has also been extruded into thin fibers and used to manufacture upholstery materials, hygiene products, and sports apparel. Another huge benefit of PLA coming from plant-based material is that it can break down naturally when exposed to the elements. If you have any ruined PLA prints lying around your workshop, you can just dispose of them in a landfill, and the millions of bacterial colonies will take care of breaking them down for you. Filament manufacturers have taken advantage of this characteristic of PLA by coming up with fully biodegradable composite filaments that combine PLA with another biodegradable component. The super-popular wood filament is a good example of this, as well as the highly unusual beer and bacon filaments. The capability of manufacturers to combine PLA with additives can also go the other way. 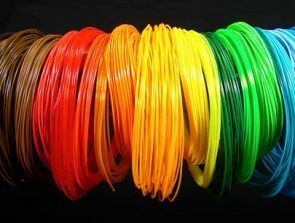 You may encounter PLA filament products that contain dyes or other additives that may not be biodegradable. Before you chuck off that scrap PLA print into a compost, take the time to read the label of your PLA filament and make sure that the filament is 100% biodegradable. If not, then you need to dispose of it as you would any plastic product – give it to your local recycling facility or recycle it yourself. ABS stands for acrylonitrile butadiene styrene, a terpolymer, or a polymer that is composed of three different monomers. These monomers – acrylonitrile, butadiene, and styrene – can be present in varying proportions according to the desired characteristics of the product. Acrylonitrile provides chemical and thermal stability, butadiene provides toughness and impact strength, and styrene gives the finished product a smooth and glossy finish. Aside from ABS products with a variety of proportions of the different monomers, composite ABS has also been developed. Blends with polyvinyl chloride (PVC), polysulfonates, and other polycarbonates have varying commercial and industrial uses. ABS became commercially available in the 1950s initially as an improved version of standard synthetic rubber. It soon became widely used in the field of engineering polymers due to the wide range of copolymers it can produce and the ease of its processing. ABS is highly valued due to its superior hardness, electrical and chemical resistance, toughness, and glossy finish. With its characteristics putting it squarely between commodity plastics and high-performance engineering plastics, ABS has become one of the largest selling engineering thermoplastics. What are the characteristics of ABS? Much like PLA, ABS also has a set of advantages that have made it appealing to manufacturing industries and the 3D printing community. It also has a few setbacks, as you’ll see below. The three monomers used in creating ABS – acrylonitrile, butadiene, and styrene – are produced from hydrocarbons that are derived from petroleum products. Acrylonitrile is made from the reaction of propylene and ammonia; butadiene is a product of cracking of long-chain hydrocarbons, while styrene is made from the dehydration of ethylbenzene. ABS can be enhanced by various additives and copolymers that can enhance its physical and chemical properties. Although the plastic industry has pretty much perfected the manufacturing process for ABS, it has dropped from public favor in the past couple of years due to its dependence on petroleum products. The hydrocarbons needed to produce the monomers of ABS are most easily produced through the crude oil refining process. This makes ABS just like any typical plastic – non-sustainable, not environmentally friendly, and not biodegradable. In today’ market climate where consumers are geared towards buying sustainable products, the dependence of ABS on petroleum may cause its decline in popularity. ABS prints at a much higher temperature compared to PLA – between 220 to 250 °C. It’s the exact opposite of PLA at this regard, making ABS printing an inherently power-intensive process. Since your 3D printer will be consuming more power to heat up the hot end nozzle, your electric bill can also take a hit, especially if you are spending a lot of hours printing with ABS. The high printing temperature of ABS also leads to a host of complications that you’ll need to manage in the printing process. Since ABS filament is extruded from the hot end nozzle at a much higher temperature, it cools on the build platform at a much faster rate. This rate of cooling leads to the accumulation of thermal stress in some points of the print, resulting in warping of edges and corners. The propensity of ABS to warping has become one of its most well-known properties, and something that 3D printing professionals have to prepare for. When printing with ABS, a heated printing bed is a must. This is often not enough, and you will have to aid bed adhesion with a layer of Kapton tape or a thin application of hairspray. Warping can also be reduced by slowing down the cooling process, so you will likely have to augment your 3D printer with an enclosure. Aside from misshapen prints, warping also tends to result in shrinkage of the print. Thus, you may end up with a build that is slightly smaller than what you intended. This shrinkage is something you’ll need to consider in the design phased of 3D printing. One more issue that 3D printing professionals will have to contend with when working with ABS is stringing. The high printing temperature of ABS makes it especially prone to stringing when the print head is moving across the build platform. To prevent this, fine adjustments will have to be made to the printer’s retraction settings and print head travel speed. 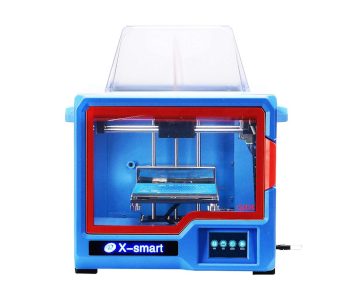 Although, stringing is a fairly common problem and can be solved with just a bit of tweaking, it just another entry in the list of things that you will need to worry about when using ABS filament. One more thing that ABS is known for is that it produces fumes with a strong odor during printing. While inhaling small amounts of these fumes isn’t harmful, you might have breathing problems if you are in a confined space filled with the fumes. Newer 3D printer models are equipped with a HEPA filter system that can remove the noxious components of the fumes. If your 3D printer does not have this feature, then make sure to print in an open area with good ventilation. Despite all the complications involved in building an ABS print, it is still a very popular filament material. Its high printing temperature is merely a manifestation of its excellent heat resistance, making it the preferred material for items that are meant to be exposed to high temperatures. It is also known for its good mechanical properties. Objects made with ABS have superior toughness and impact resistance, making them durable against regular usage and wear. Items made for outdoor use are also typically made from ABS, as they can withstand UV radiation and other outdoor conditions better. It is in this aspect that ABS is treated just like any other plastic. Being petroleum-based, ABS cannot be degraded by biological means. This means that objects printed with ABS can persist in the environment for several decades to more than a century. The problem of solid waste is one of the more pressing concerns for humans. This mindset is also quickly gaining traction in the mainstream consumer base, which is a potential reason for the reduced use of ABS. However, ABS is still not all bad. Being a thermoplastic, ABS can be re-melted and reformed into other shapes for an indefinite number of times. This makes scrap ABS prints easily recyclable. In fact, there are now desktop-scale extruders that can convert small pieces of plastic scrap into a good-as-new filament. With the right equipment, it’s possible to a closed-loop recycling process for your ABS materials, so you can help in alleviating the solid waste problem. Should I use ABS or PLA? Now that we know the benefits and setbacks in using either PLA or ABS, we can come up with a decision-making system on which filament you should use. If you are just setting out to make your first 3D printer build, then we recommend that you start with the relatively fuss-free PLA. In contrast to ABS, PLA can be printed without a heated printing bed, with a simple bed adhesion aid, without an enclosure, and a cooling fan. Since PLA is not prone to warping or stringing, you wouldn’t need to mess around with settings as much just to get a successful print. Using with a PLA filament for your first print is perfect for getting your toes wet with regards to 3D printing. It’s simple enough for things not to go wrong and will give you the confidence to tackle bigger and more complicated projects. FDM prints naturally come out with a rough and uneven finish because of the lines demarcating where one layer ended and the next one started. This is fine for hobby printing, but if you want to use your prints for any commercial purpose, you are probably going to have to do some post-printing processing to give your prints a smooth look. It’s possible both PLA and ABS filaments to get a polished finish. However, ABS has the distinct advantage of being soluble with a commonly available solvent, acetone. One of the most common ways to finish an ABS print is to give it an acetone vapor bath, which melts a very thin layer of the print’s outside surface. The result is a perfectly smooth finish that is consistent even on the tiniest details. On the other hand, finishing PLA requires a lot more elbow grease. The process is almost entirely mechanical – you start by sanding away the rough details, applying a polishing solution, and perhaps applying some paint. It’s simple, but it takes a lot of time and a whole lot of manual work. Even then, it’s almost impossible to get a consistent finish for highly-detailed PLA prints. If you need to come up with a print with a visually striking finish, we suggest sticking with ABS. The results of an acetone vapor bath are unequaled in quality and do not require as much work. This has nothing to do with the printing process or quality of the final print, but with how our choices as consumers can affect the bigger picture. ABS, although superior in terms of durability and physical integrity, is not biodegradable. Although it’s possible to recycle ABS prints, they will ultimately still end up in a landfill – if not now, then perhaps a few months or years down the road. Moreover, ABS is derived from a non-renewable and non-sustainable source. This is perhaps the biggest benefit of PLA, and what may usher its dominance in the 3D printing field. PLA is 100% biodegradable. This means that you never need to feel bad about creating misprints with PLA, as they can be easily disposed of. PLA also has the benefit of being derived from plant material – sources that are very sustainable. There have even been studies made on how PLA can be manufactured from what are essentially waste materials, such as plant hulls and stalks. There’s one more factor that we have neglected to mention why PLA and ABS are so popular: the fact that they are very cheap. You can get a 1-kg. spool of either ABS or PLA filament for less than $20 and this is enough material to make dozens of 3D prints. Since they are so popular, printing with ABS or PLA is as easy as ever with the wealth of how-to guides and videos available online. Each type of material has its merit, but we think there is one distinguishing factor that stands out from the rest: PLA is simply the more environment-friendly option. Now, we’re not under the impression that a shift from ABS to PLA will spark an environmental revolution. The 3D printing community is simply too small to have that much of an effect. However, we as individual consumers all need to do our part to reduce solid waste production. Are we going to reach a point when ABS and other non-biodegradable filaments will be eliminated? Probably not, in the same way that the human race has not weaned itself off plastic products. However, any shift in mindset and preference towards more sustainable practices and solutions is a step in the right direction. How Much Does 3D Printing Filament Cost?